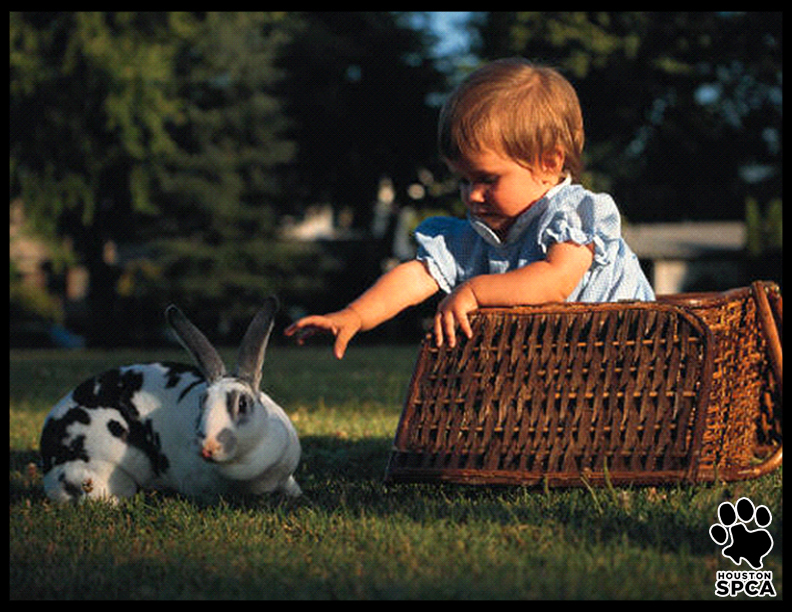 Peter Cottontail, Bugs Bunny and Thumper are fictional characters that most children adore. In reality, baby bunnies (chicks and ducklings) are not only adorable, but also very fragile. They can be easily injured or killed by young children who may over-handle them or handle them incorrectly. In addition, they have special dietary and housing needs in order for them to thrive. Unfortunately, in the weeks following Easter, the Houston SPCA and its subsidiary, The Wildlife Center of Texas, may receive countless unwanted Easter bunnies, chicks and ducklings. The Houston SPCA strongly urges parents to avoid putting a live animal in their child’s Easter basket. Instead, parents should consider putting a cute, cuddly stuffed toy animal in their child’s Easter basket this year. They don’t eat much, require no training or grooming, and there’s no mess to clean up. You can also be a part of the solution by making a donation in your child’s name to a local shelter or rescue group that provides care for unwanted Easter animals who become orphaned, abused or neglected.